All Time Series: First ever meeting between the schools. (Last new opponent Orrville played was Mooney in the 2006 playoffs). Orrville has now played 137 different schools in their history. Last Week: Orrville beat Clear Fork 28-7, Genoa beat Milan Edison 62-7. 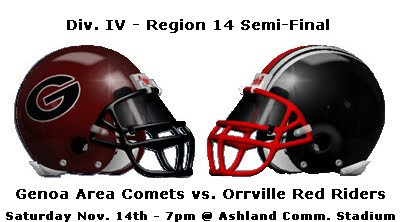 Playoff History: Orrville is making their 20th appearance in the playoffs, their all-time playoff record is 24-18. Genoa is making their 3rd appearance (all in the last 3 seasons) and is 5-2 all-time. Coaches: Doug Davault is 31-13 in his 4th year as Orrville coach, he's 3-1 in playoff games (2 appearances). Mike Vicars is 34-3 as Comet coach, including 5-2 in the playoffs. His career coaching record is 132-96, with an all-time playoff record of 10-9 (10 appearances). Don't let the numbers scare you...this Genoa Comet team is good, most playoff teams are, but they're not invincible. We've beaten better teams in our 20 years of playoff appearances..and we've beaten teams this season that would give Genoa a run for their money. I'll tell you why this team is ripe for the picking, and why the Riders are the right team to knock them from their perch of uncrowned state champions. Genoa fans don't like to hear it, but it's the truth....The Comets play one of the weakest schedules in the entire state. Stat nerd College of Wooster Professor Drew Pasteur runs the Fantastic50.net site and he ranks the Comet as having the 530th toughest schedule in the state (out of roughly 700 schools)....and 98th toughest in Divsion 4 (out of 120-ish schools). On the flip side, Orrville's schedule is ranked #100 out of all teams in the state, and #1 in Division 4. 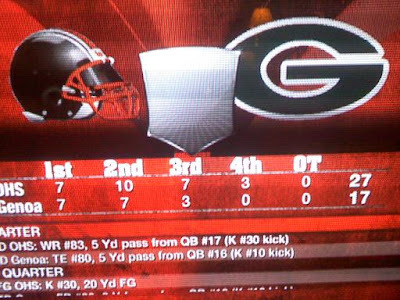 The difference is clear and indisputable....too bad that doesn't account for a single point on the scoreboard. I've said this before, but this game reminds me so much of the 1994 playoff game against Wauseon that it's a little eerie. Just like Genoa, Wauseon was boasting an "invincible" defense, Wauson had allowed 43 points through 11 games, Genoa has only allowed 34 points through 11 games. Orrville heard all week about how they'd be lucky to stay on the field. Wauseon came into the game with a 26 game win streak and as the defending state champs. Don't believe me...check out this article from the Toledo Blade. Sure reads very similar to this year's Genoa team doesn't it? Read all the glorious details here and here. It was very interesting reading up on Comet coach Mike Vicars, a guy who has been a head coach since the late 80's, but isn't 50 years old yet. His first gig was at Holgate from 1987 to 1988...he went 1-19 over 2 seasons.....not a great start, but everything since has been solid. His hallmark has been coming into bad situations and turning them around. After Holgate was Ada, he coached there from 1989 to 1994, going 21-39 and making the schools first ever playoff appearance in 1994. After taking 2 years off, Vicars reappeared at West Unity Hilltop, going 14-6 in 2 seasons. Then the job that put him on the map...Delta. He was there from 1999-2006 and had a record of 62-29, making the playoffs in 6 of the 7 seasons he was there. This was another school that he took to the playoffs for the first time in school history. He left Delta to become the Genoa coach in 2006, and immediately led the Comets to their first playoff appearance as well. Unreal. He's had three straight 10+ win seasons and has led teams to the playoffs in 9 of the last 10 seasons, had led 2 different teams to the state semifinals, and has all 10 of his playoff wins in the past 8 seasons. You simply do not come in to bad situations, turn things around and establish a winning tradition and a winning attitude, and do it at several different places without being an effective and special coach. If nothing else, the Comets will be well led and well prepared...just as we hope to be. Greg Hillabrand - Power back, linebacker on defense, 1300 rushing yds and 25 TD's. Matt Bassitt - 1400+ passing yds, 24 TD's and only 1 INT. Conner Wendt - Can do it all, rushing and receiving. 650 yds rushing and 11 TD's, 680 rec. yds, 14 TD's. All very impressive...more impressive when you consider that many games, these 3 did not play in the 2nd half. We have a chance, more than a chance really...simply because the game is scheduled to be played. We will not lose the game as we step off the bus as more than a few of Genoa's opponents have done this year. We will not be intimidated by their intensity. We will not bow in awe at their talent. We beat a true Goliath in the form of Youngstown Ursuline in the 98 playoffs....we had no chance, and were told that even showing up would be a bad idea...but heart and talent and team won out that day. I think we certainly have the talent and the balance to make this game interesting. We have experience, intelligence, talent, heart and toughness that Genoa hasn't seen all year. The longer we stick around, the more confident our kids will get...and maybe, just maybe....Genoa will wear down OR start to question themselves....maybe they'll get desperate and take silly chances or make poor decisions. I'll let the pictures doing the talking. Riders win again....27-17. I wasn't even in the house when the computer played the game...so no accusations. I did look at the highlights though. Genoa had a 14-10 lead right before half when they threw a pick that got returned for a TD....and then Orrville returned a kick 90 yds for a TD in the 3rd. Ballgame. Very similar to actuall Orrville teams, big plays and tough D. Maybe our hallmark. I guess it applies in virtual reality too. Fantastic 50 says Genoa by 8. Calpreps says Genoa by 7. Genoa fans say Comets by 3 TD's plus. (no exaggeration.....they simply can't be bothered by the prospect that we may make this a game). This is a tough one...Genoa is certainly a team to be reckoned with...how we defend Genoa's balance will be key. Sure, they're a run team (and a wing-t run team to boot)..but they have the athletes to put it in the air also. Their QB averages a TD pass every 5.5 attempts and their backs average a rushing TD every 5 attempts also. They are efficient and will exploit weaknesses and take advantage of mistakes. Orrville will need to play mistake free, smart and with intensity that we may have only seen a few times this season (the 2nd half of the Lexington game sticks out). Our kids have waited 2 years for this opportunity, and have fought through a tough season with injuries and distractions all along the way. This is their chance to make all of that right. Orrville 28......Genoa 24. Riders march to the regional finals. Good luck Riders from Smithville! By the way where are Rider fans going after the Huddle changes? Thanks for the well wishes...good luck to you guys in volleyball too. Hope they can bring the title back to Wayne Co.
As far as the huddle....a quick poll of my fellow Rider huddlers say they're staying and coughing up the $12. So as I udnerstand it, we're not going anywhere, much to the dismay of every other county school. I'm undecided. Not a fan of how they run things, and how they've handled this situation....I understand the need for more operating revenue, but the mistake they made was opening the flood gates to everyone for free and hoping the ad revenue that a 150,000 member website would bring in would be enough. They obviously miscalculated, and now everyone gets to pay for it. Oh well. Thanks for your comment. Nice site. Good research. I might have questioned the strength of the S.L.L. also but after Eastwood knocked off Galion i wouldnt say the league is the weakest in the state. Please fix the comment "We will now bow in awe at their talent"
I assume now should be not...correct? What were the problems for orrville in the two losses the first two games of the season? Other than facin two respectable progams,were there any injuries? We had some suspensions at the beginning of the season that basically left us without 4 of our top players including our QB, two of our WR's and our stud TE/LB. I'd say if we had them, we definately win one of our first 2...possibly both. Orrville fans are the most disrespectful fans I have ever seen in my life. When Genoa kids were crying that they're season was over Orrville fans began to chant "overrated". I hope OG takes it to you guys next week and I'll be there to see it. "Orrville fans are the most disrespectful fans I have ever seen in my life." Looked in the mirror lately? Or maybe it's just your players that are disrespectful. If #30 worried about holding on to the ball as much as he worried about gesturing to Orrville fans, maybe you win the game. "I hope OG takes it to you guys next week and I'll be there to see it." First off, the game is this week, not next...and if O-G wins, they'll do what you didn't, or couldn't maybe. Wouldnt you want us to go all the way and at least say you got beat by the best? "Orrville fans began to chant "overrated"
Thanks for the visiting. Maybe we'll meet up next season.